2. In a saucepan, cook milk, butter and sugar till butter melted, while is warmed add in sifted cake flour and mix well using a whisk. Combine egg yolks one by one to continue whisk it well and set aside. 3. In a mixing bowl, Whisk egg whites till foamy and add in sugar gradually whisk till stiff peaks. 4. Add one third of meringue to the cooked dough while the dough is still warmed and fold in lightly, then add remaining meringue and fold to incorporate completely. 5. Take 1/4 of the plain batter and mix with the matcha paste together. 6. 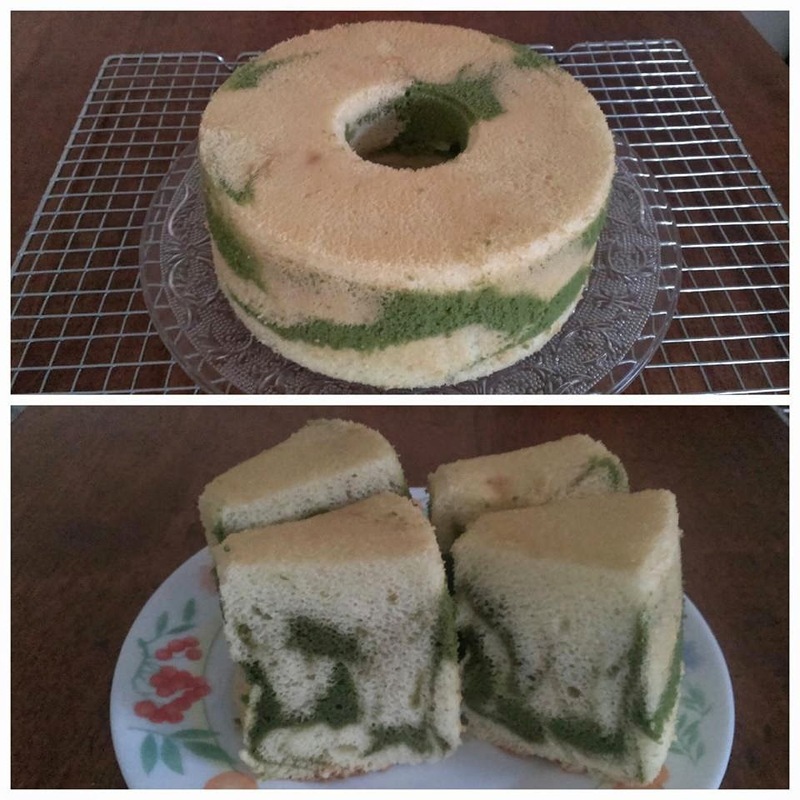 Spoon plain and matcha batter alternately into an ungreased 17cm chiffon cake pan, till all the batters are used up. Gently shake and bang the pan on the table top to release air bubbles and use a chopstick to stir the batter gently to create swirl. Smooth the surface with a rubber spatula. 7. Bake at 170 deg C for the 1st 10mins, then 150 deg C for 35mins. 8. When cake is done, remove from oven and turn the pan over. Leave cake to cool in pan completely before removing it from the pan and cut it.